Coppper Vessel Sinks. Custom Design Sinks By Size And Patina Finish! 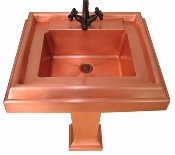 Custom Copper Vessel Sinks. 200 Decorative Designs. Everthing We Build Is Built To The Customer's Specifications. You Choose The Size, Decorative Design And Mix & Match 16 Patina Finishes. 200 Decorative Designs Available. View Recently Made Copper Products. Copper: What's New? Copper Vessel Pot Sink 17" x 12" Copper Vessel Rectangle Sink 17" Copper Vessel Round Sink 17.25" Copper Vessel Short Apron Sink 14"
Copper Vessel Short Apron Sink 16" Copper Vessel Short Apron Sink 18" Copper Vessel Sink Copper Vessel Sink 16.5"
Need Help Placing An Order Or Have Questions? Call Customer Service At 800-989-5166. Before Buying, Be Sure To Check Our Coupon Page For Our Latest Sale Discounts!